Do you have a beautiful home with a utility box or meter that sticks out like a sore thumb? A meter or utility box is necessary if you have electricity or gas supplied to your home. 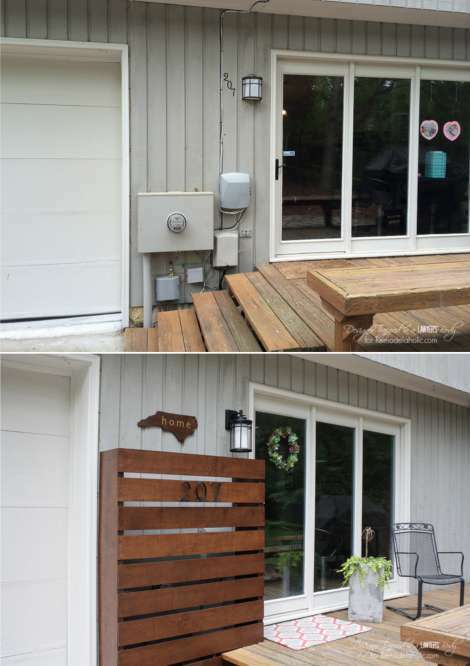 However, you can add a cover or wood screen to hide a utility box. If you are familiar with a wood barrier around air conditioners, then a wood screen to hide a utility box is really similar. All you need to do is build a frame with some scrap lumber and add a few panels. This project is not very difficult and can easily be done in about one hour. One thing to keep in mind about adding a wood screen to hide a utility box is making sure the box is not obstructing the view of the meter. This will not be an issue if the box is removable or you have added a set of hinges.